“Success is not final” – That’s the first part of a famous Winston Churchill quote we discuss in a recent blog post titled “How to Handle Failure and Success in Your Business!” And this guide to creating multiple streams of income for your freelance business can be considered a companion to that post. If you’ve been a freelancer or virtual assistant for a while, you may have already faced the challenge of maintaining a consistent income. Even with a roster of fantastic clients, projects are not always spread out evenly throughout the year. And the economic climate can affect your clients’ businesses, creating dry spells for you. Technology may change, making certain services obsolete, or you may need to take some time off for personal reasons. If you’ve been relying on a certain type of client work as income, you may want to consider adding new offerings to your freelance business. In our “Creating Multiple Streams of Income” course, Freelance University co-founder, Craig Cannings, encourages us to “dream big” and enlarge our vision of what we can do. He says to “think scalable” and imagine some ways we can build onto our existing business. In Victoria, BC, the Dutch Bakery and Diner is an example of a brick and mortar business that has diversified over the years. In 1955, the original owners rented a coffee shop and now use that space to run a restaurant in the back and a bakery in the front that sells cakes, pastries, and cookies. They also make chocolates and custom wedding cakes. And, most recently, they’ve started selling online delivery orders through SkipTheDishes. Another well-known example is Amazon.com. As Leslie Truex discusses in her article, “How to Create Multiple Streams of Income in Your Home Business,” Amazon began by selling books and now sells thousands more products, publishes print and digital books, and even produces television shows. So, how can you build onto your business? As a freelancer or virtual assistant, your streams of income may look different from the examples above. And just like all the freedoms we enjoy in our location-independent work, we can tailor our services to suit our skills and passions. Determining additional income sources is similar to determining your niche. You can look at your skills, your passions, and client demand to decide what might be lucrative for you. The article above suggests mind mapping your thoughts by writing your main product or service in the middle and then creating four spokes titled “Products,” “Services,” “Advertising/Affiliate,” and “Other” extending off your existing business. You can then create spokes branching off from each category and brainstorm specific ideas. In our FreeU course, Craig Cannings suggests starting with one income stream at a time and waiting until the first one is secure before starting on a second one. He also recommends seeking passive income streams that involve less time and more money. Right now in my business, the income streams are all active. They involve a trade of money for work. My main services are writing/editing, and in some cases I do mentoring, consulting, and content management tasks. Other freelancers may do live teaching, coaching, speaking, and other tasks they must perform themselves in order to earn income. You can see how adding more and more active income streams proves difficult. There are only so many hours in the day, and you have only so much energy to expend. Passive income streams offer a way to earn automated income that doesn’t require ongoing work. But both passive and active streams are valuable for your business. You may even enjoy your work so much, you’d love to add more of it. Just be sure that you balance out how many active tasks you can handle and decide when it’s time to add some passive income. If you often receive requests for services you don’t offer yourself, you may want to hire team members who can perform these tasks. That way, you don’t have to turn clients away, and your business can earn a percentage. You’ll be responsible for managing the team, but it does ease some of your workload. In your work as a freelancer or virtual assistant, you may use products you’d wholeheartedly recommend or work for clients who sell products you believe in. As an affiliate, you can earn money by promoting these products on your site, through your email list, or in social media. Sites like ClickBank have an affiliate marketplace where you can browse categories and search for products to promote. Ideally it’s best to promote products that fit your business and target audience. All that time you’ve spent learning your skills and performing tasks can pay off when you apply your knowledge to coaching or consulting. Many new freelancers benefit from the wisdom of someone who’s a little further ahead in the road. In your business, you can add this income stream by allowing people to book appointments through an online scheduler like Acuity and then meet with you through a video conferencing tool like Zoom. You could also provide this service in person if there’s a demand in your local network. He suggests selling t-shirts using Printify, a service that can integrate a WooCommerce store (as well as Shopify or Etsy) with a print-on-demand service. In that case, you could create a graphic, upload it to the service, and Printify would print and ship the t-shirts when people order them. Hughes explains that if web design is your niche, you could use your skills to design and market a website to sell shirts using WordPress. Dropshipping is a great option to consider and worth brainstorming about. Here at Freelance University, we’re big fans of online courses. Although they require time and effort upfront, they’re a valuable way of sharing your expertise and automating your income. If your target audience has certain challenges or problems that occur regularly, you may have a market for a course that offers solutions. To design your course, you’ll need to determine your ideal topic, create an outline, choose a technology like Thinkific, and create a marketing plan. Over time, you can decide which courses are evergreen and which ones will require regular updating. Another way to add an income stream is to brainstorm ways you could run a monthly membership or subscription service through your site. For example, as a writer, I could provide a monthly coaching program for entrepreneurs wanting to hone their business writing and grammar skills. With a subscription model, you could provide monthly technology maintenance as part of your services. Programs like these can help you earn more consistent income throughout the year. • What marketable skills do I have? • What services are in demand by my target audience? • What percentage of my income should be passive vs. active? • How much time can I devote to launching a new income stream? • Can I launch this new stream on my own, or do I need to hire a team or partner with a colleague? As we mentioned above, adding new income streams, especially passive ones, can help you gain a more consistent income throughout the year. It can also give you the freedom of earning money while you’re away from your desk. How wonderful to check your accounts and realize you sold a book while you were sipping an espresso at your favorite coffee shop! As time goes on, you may decide that you’d like to spend less time at your desk earning income, or that you’d like to shift the focus of your services. In an article titled “Freelancers: Diversify your income to make sure you get paid. Here’s how,” Raubi Marie Perilli says that exploring other options for making money can lead you to new prospects and clients, as well as expanding your knowledge and leading you to side revenue streams that may be “more lucrative and successful than your primary source of income, which could lead you to change your business model or future plans.” In addition, you can boost your authority and influence in your niche by providing more than one product or service offering. The last part of Winston Churchill’s quote is “Failure is not fatal. 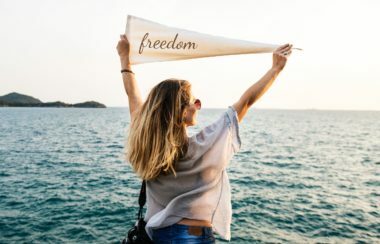 It is the courage to continue that counts.” If you’re exploring new income streams out of necessity, this “Quick Guide to Creating Multiple Streams of Income for Your Freelance Business” can give you the courage to continue. And if you’re planning ahead, enjoy the process and take your time exploring new options. We’d love to hear your thoughts and any tips you might have on adding new income streams. Please share your questions and comments below! Great article, Jena! It really hit a few chords with me. As a fairly new freelancer, I have already experienced a few of the ‘ripples’ you spoke about (late pays and one client going ‘on-hold’), so your article was very timely! This is something I definitely need to look into! Thanks again!! Thanks so much, Karen! I’m so glad the article is helpful. Wishing you all the best as you explore new income streams for your business. It’s hard when those ripples come, but ultimately we end up enriching our experience and service to our clients when we diversify.